When is a new book not a new book? When it’s a new way to get the entire Jo Durbin Mys­tery series all in one e-book, that’s when! And what’s a pre-order? Okay, that’s some­thing I just learned how to do. This new book comes out on Decem­ber 16, but it can be ordered now at a low price. For a short time, it costs only 99 cents. What’s in the book? The pre­quel nov­el­ette, Book 1, and Book 2. That’s a nice long read. Here’s the blurb. 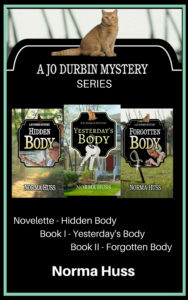 This col­lec­tion includes the com­plete series: Hid­den Body, a pre­quel nov­el­ette, Yesterday’s Body, Book 1, and For­got­ten Body, Book 2. Jo is helped, or hin­dered, by her sis­ter Kaye, by Mel, the man who wants to be more than a friend, and oth­er char­ac­ters, not the least of which are the police who seem to always be on her case. Avail­able for pre-order at the fol­low­ing e-stores: Kin­dle: Nook, Apple, Kobo, and oth­ers at the Uni­ver­sal Link.